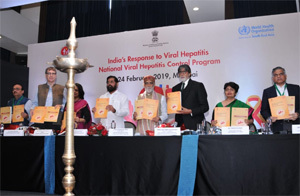 MUMBAI: The 'National Action Plan – Viral Hepatitis' to provide paperless and free health care for all was launched here on Sunday by Union Minister of State, Health & Family Welfare Ashwini Kumar Choubey. The scheme will help ensure consistency in diagnosis and treatment of the disease at a national level. According to WHO estimates, viral hepatitis caused 1.34 million deaths globally in 2015, a number comparable to deaths due to tuberculosis, worldwide. In India, it is estimated that there are 4 crore people suffering from Hepatitis B and 0.6-1.2 crore people suffering from Hepatitis C.
The Minister also released the Technical Guidelines for Diagnosis and Management of Hepatitis B. Many countries have achieved outstanding coverage with the hepatitis B vaccine, scoring an early win for prevention. In India, Hepatitis B vaccine was introduced in the Universal Immunization Program almost a decade ago.